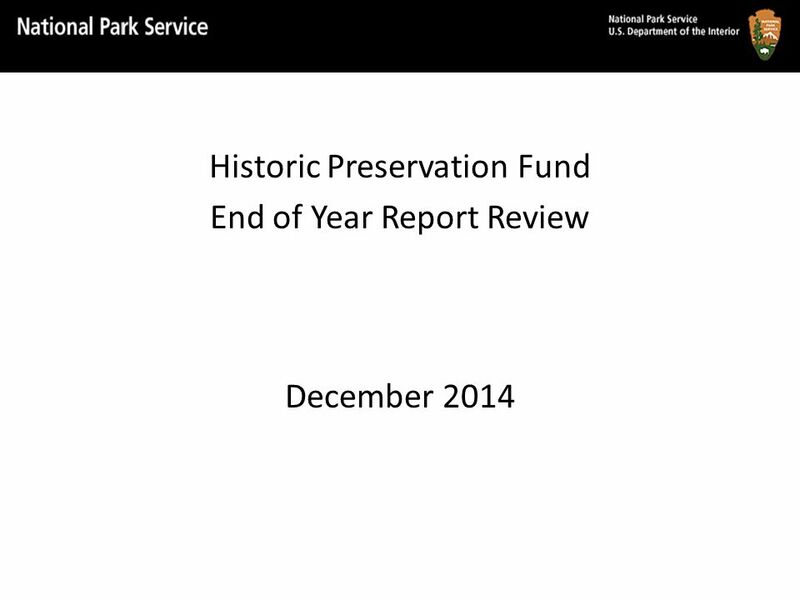 Historic Preservation Fund End of Year Report Review December 2014. 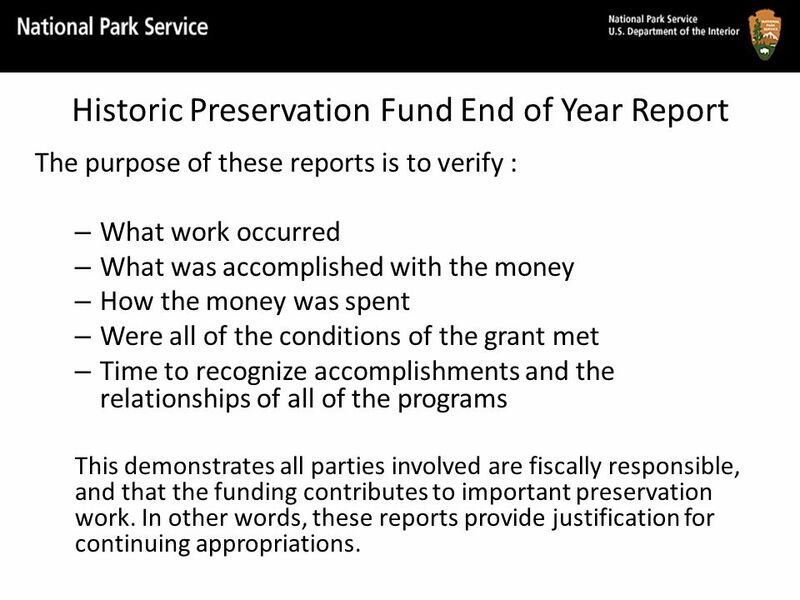 3 Historic Preservation Fund End of Year Report The purpose of these reports is to verify : – What work occurred – What was accomplished with the money – How the money was spent – Were all of the conditions of the grant met – Time to recognize accomplishments and the relationships of all of the programs This demonstrates all parties involved are fiscally responsible, and that the funding contributes to important preservation work. 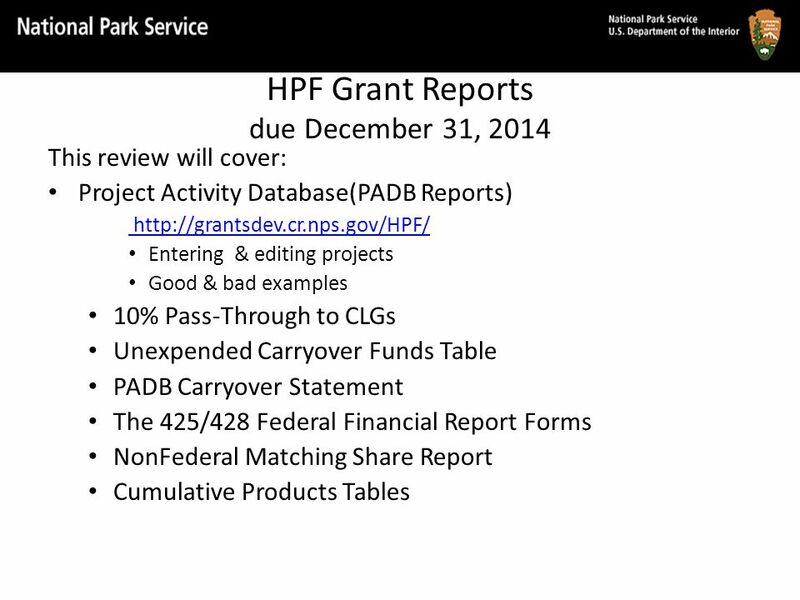 In other words, these reports provide justification for continuing appropriations. 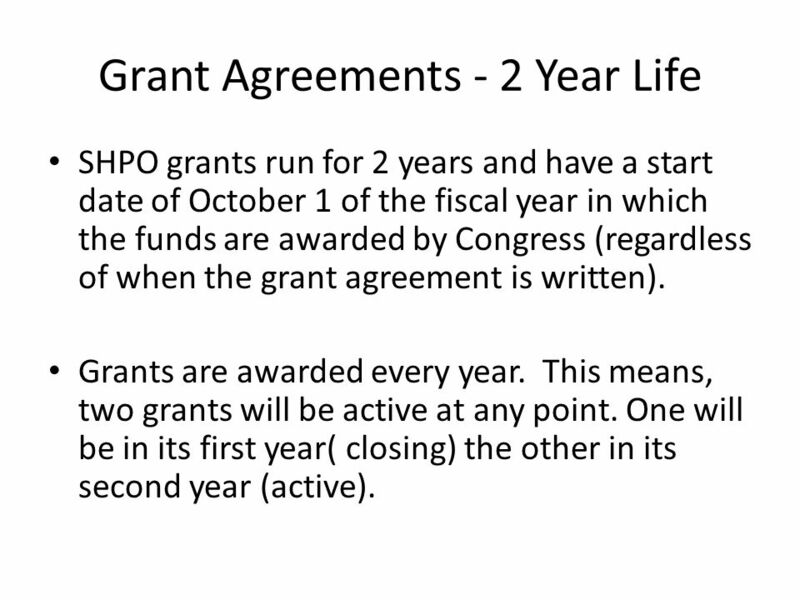 4 Grant Agreements - 2 Year Life SHPO grants run for 2 years and have a start date of October 1 of the fiscal year in which the funds are awarded by Congress (regardless of when the grant agreement is written). Grants are awarded every year. This means, two grants will be active at any point. One will be in its first year( closing) the other in its second year (active). 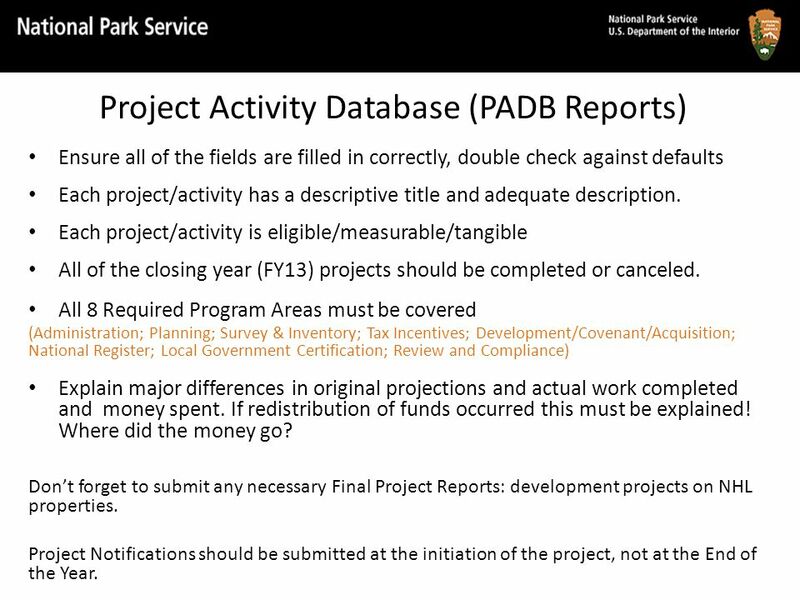 7 Project Activity Database (PADB Reports) Ensure all of the fields are filled in correctly, double check against defaults Each project/activity has a descriptive title and adequate description. Each project/activity is eligible/measurable/tangible All of the closing year (FY13) projects should be completed or canceled. 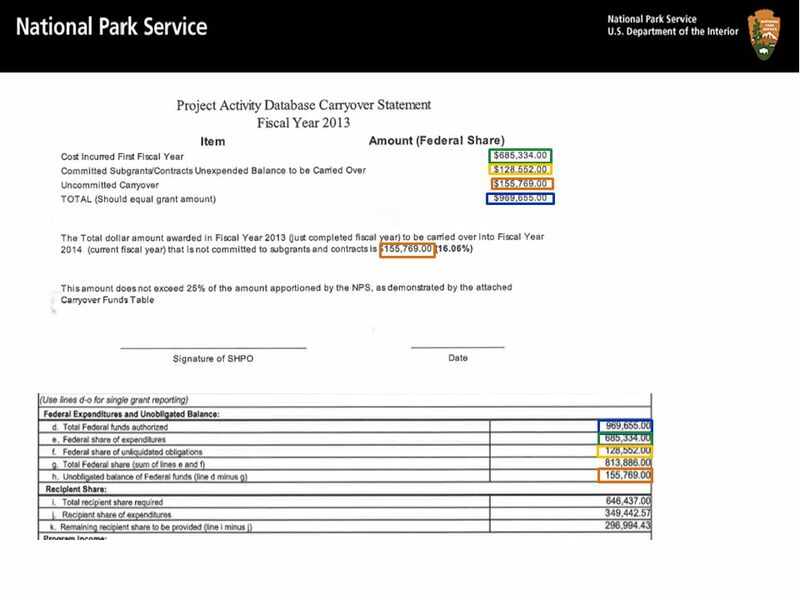 All 8 Required Program Areas must be covered (Administration; Planning; Survey & Inventory; Tax Incentives; Development/Covenant/Acquisition; National Register; Local Government Certification; Review and Compliance) Explain major differences in original projections and actual work completed and money spent. If redistribution of funds occurred this must be explained! Where did the money go? Don’t forget to submit any necessary Final Project Reports: development projects on NHL properties. Project Notifications should be submitted at the initiation of the project, not at the End of the Year. 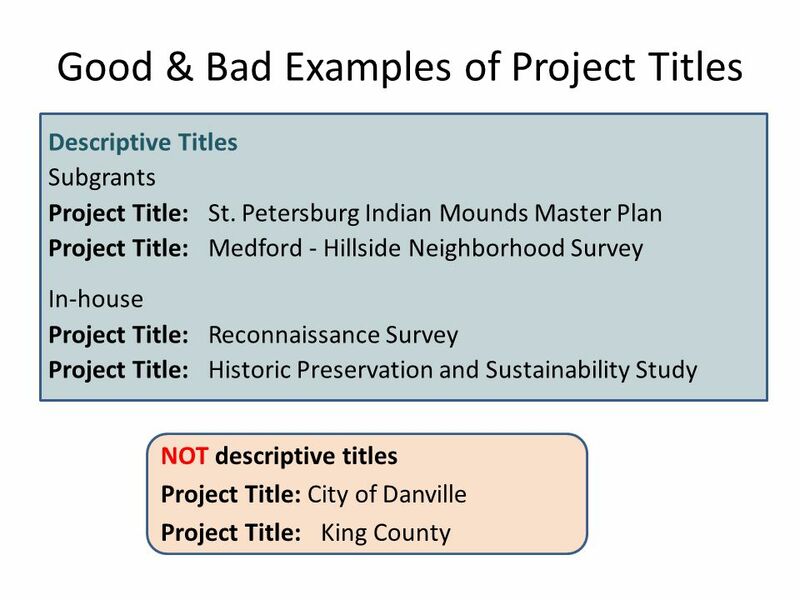 8 Good & Bad Examples of Project Descriptions NOT an adequate description Project Description: Continue adding properties to the National Register. 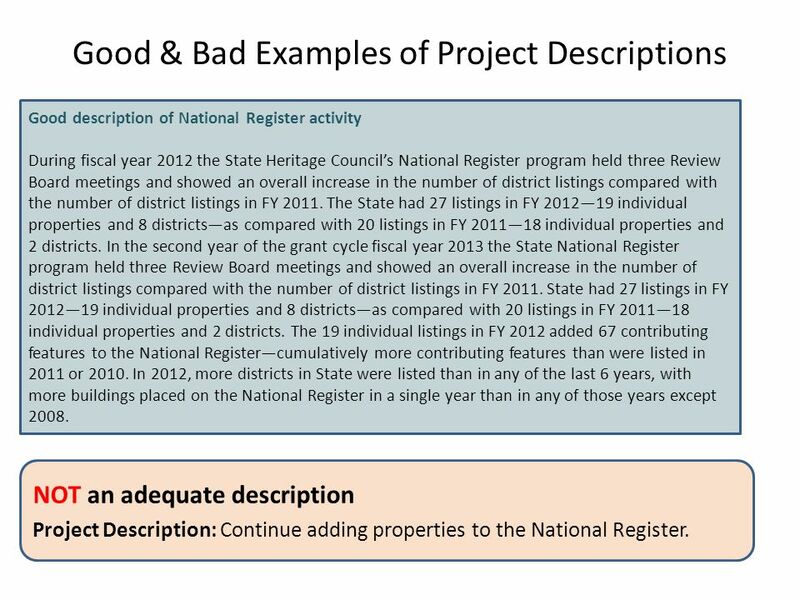 Good description of National Register activity During fiscal year 2012 the State Heritage Council’s National Register program held three Review Board meetings and showed an overall increase in the number of district listings compared with the number of district listings in FY 2011. The State had 27 listings in FY 2012—19 individual properties and 8 districts—as compared with 20 listings in FY 2011—18 individual properties and 2 districts. 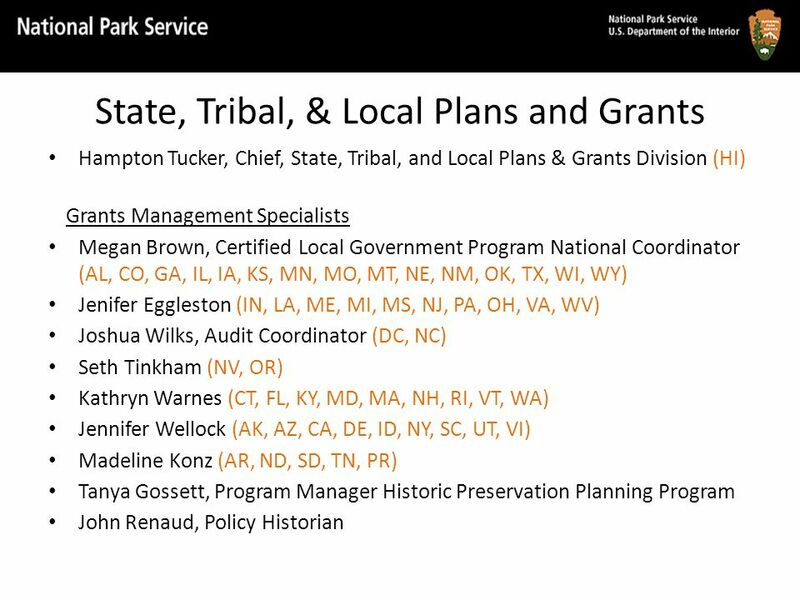 In the second year of the grant cycle fiscal year 2013 the State National Register program held three Review Board meetings and showed an overall increase in the number of district listings compared with the number of district listings in FY 2011. State had 27 listings in FY 2012—19 individual properties and 8 districts—as compared with 20 listings in FY 2011—18 individual properties and 2 districts. The 19 individual listings in FY 2012 added 67 contributing features to the National Register—cumulatively more contributing features than were listed in 2011 or 2010. In 2012, more districts in State were listed than in any of the last 6 years, with more buildings placed on the National Register in a single year than in any of those years except 2008. 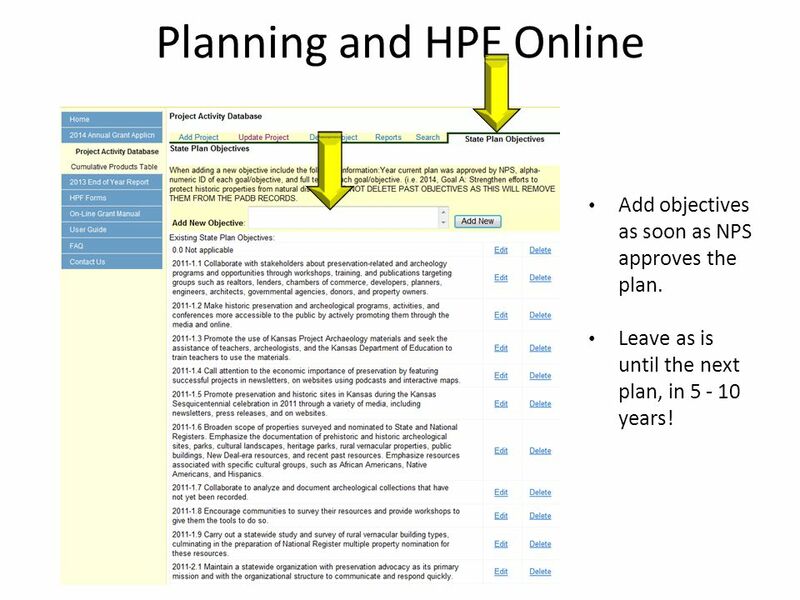 10 Planning and HPF Online Add objectives as soon as NPS approves the plan. Leave as is until the next plan, in 5 - 10 years! 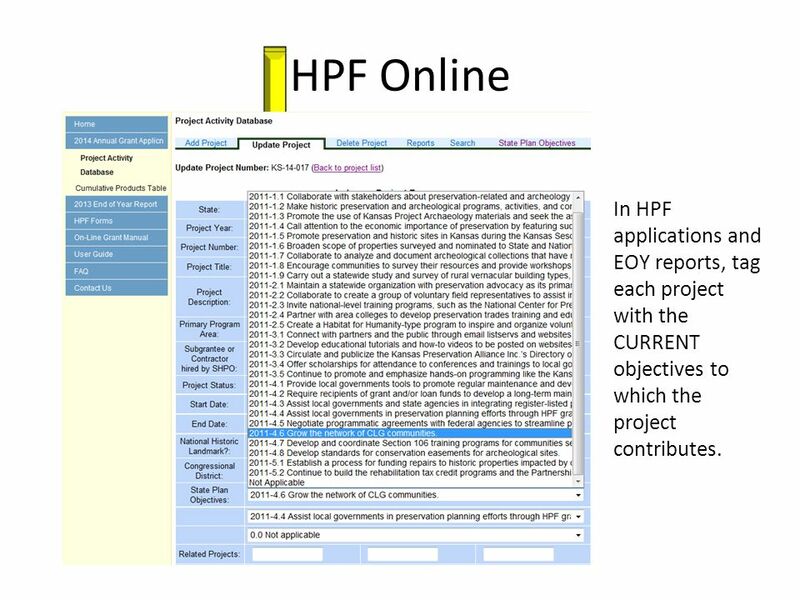 11 HPF Online In HPF applications and EOY reports, tag each project with the CURRENT objectives to which the project contributes. 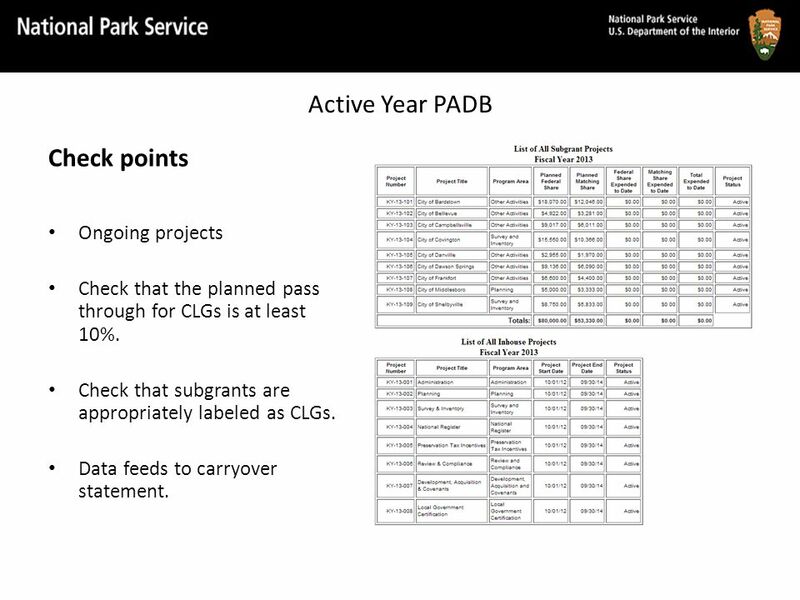 12 Active Year PADB Check points Ongoing projects Check that the planned pass through for CLGs is at least 10%. Check that subgrants are appropriately labeled as CLGs. Data feeds to carryover statement. 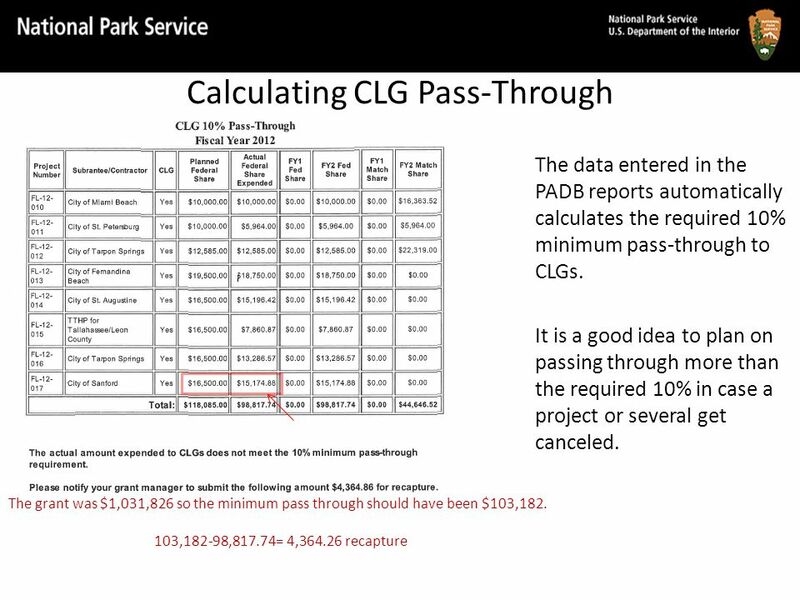 13 Calculating CLG Pass-Through The grant was $1,031,826 so the minimum pass through should have been $103,182. 103,182-98,817.74= 4,364.26 recapture The data entered in the PADB reports automatically calculates the required 10% minimum pass-through to CLGs. It is a good idea to plan on passing through more than the required 10% in case a project or several get canceled. 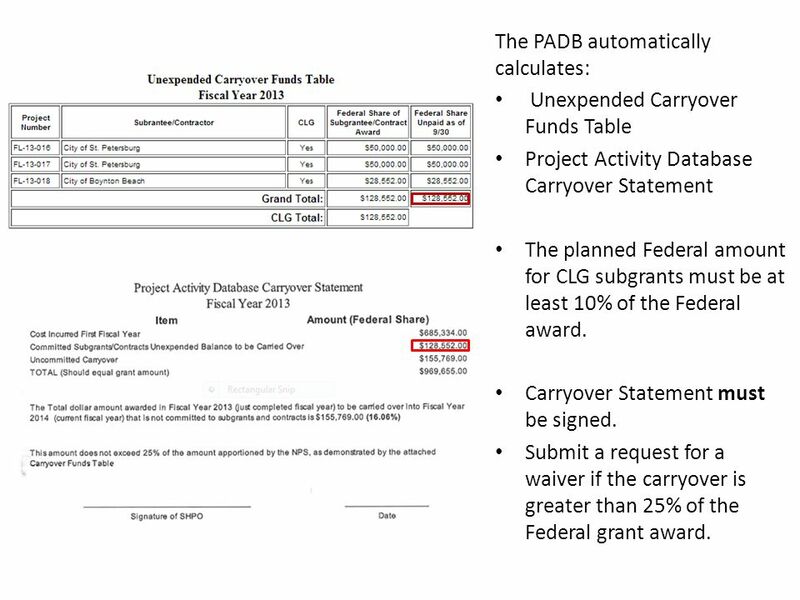 14 The PADB automatically calculates: Unexpended Carryover Funds Table Project Activity Database Carryover Statement The planned Federal amount for CLG subgrants must be at least 10% of the Federal award. Carryover Statement must be signed. Submit a request for a waiver if the carryover is greater than 25% of the Federal grant award. 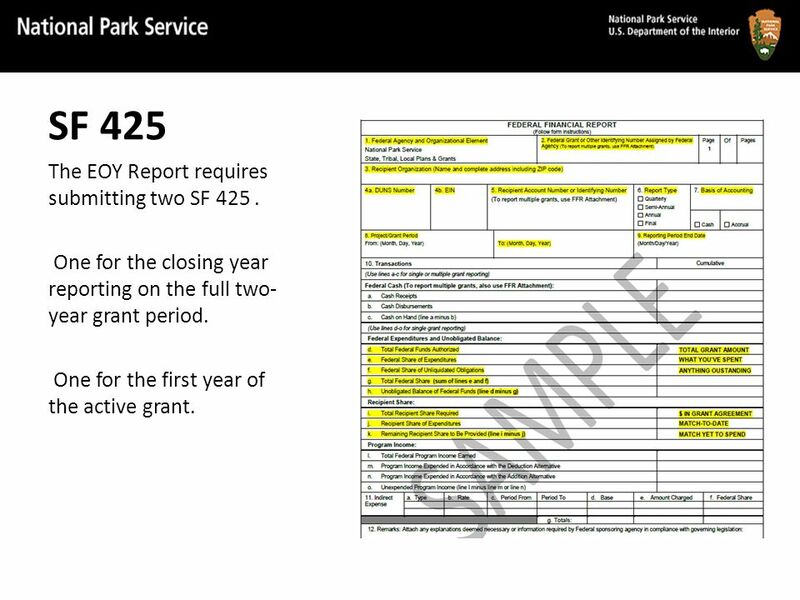 16 SF 425 The EOY Report requires submitting two SF 425. One for the closing year reporting on the full two- year grant period. One for the first year of the active grant. 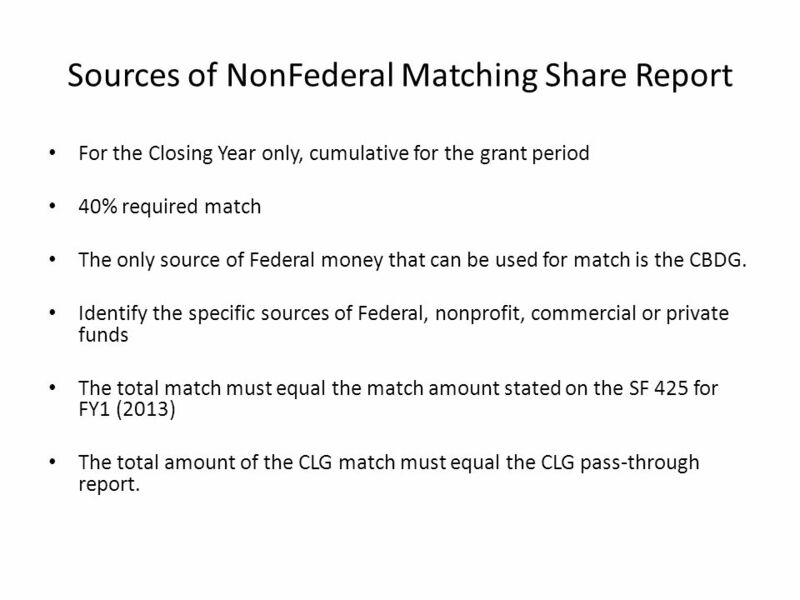 17 Sources of NonFederal Matching Share Report For the Closing Year only, cumulative for the grant period 40% required match The only source of Federal money that can be used for match is the CBDG. 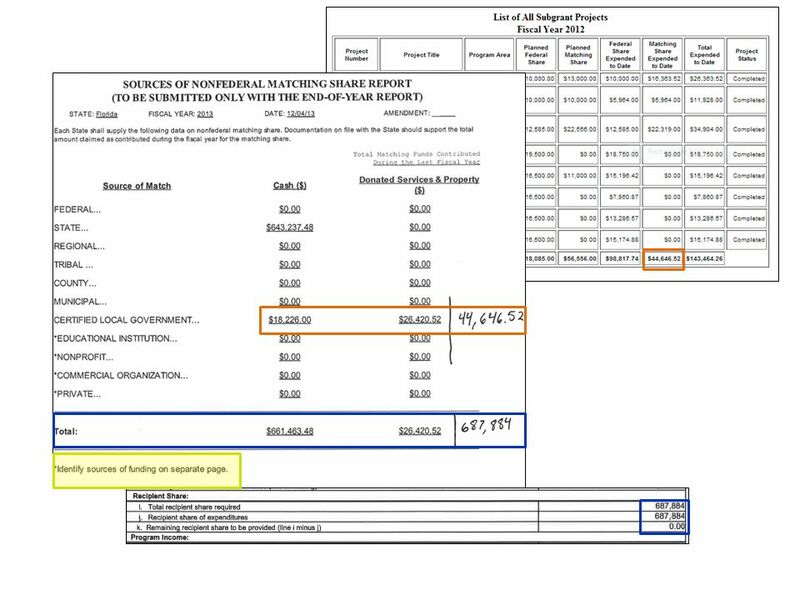 Identify the specific sources of Federal, nonprofit, commercial or private funds The total match must equal the match amount stated on the SF 425 for FY1 (2013) The total amount of the CLG match must equal the CLG pass-through report. 19 SF 428 SF 428 series are a new requirement this year. 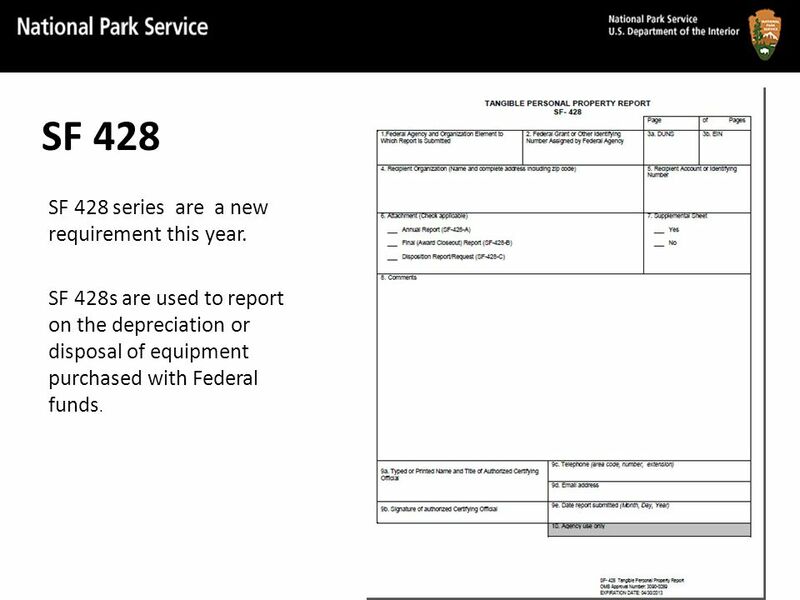 SF 428s are used to report on the depreciation or disposal of equipment purchased with Federal funds. 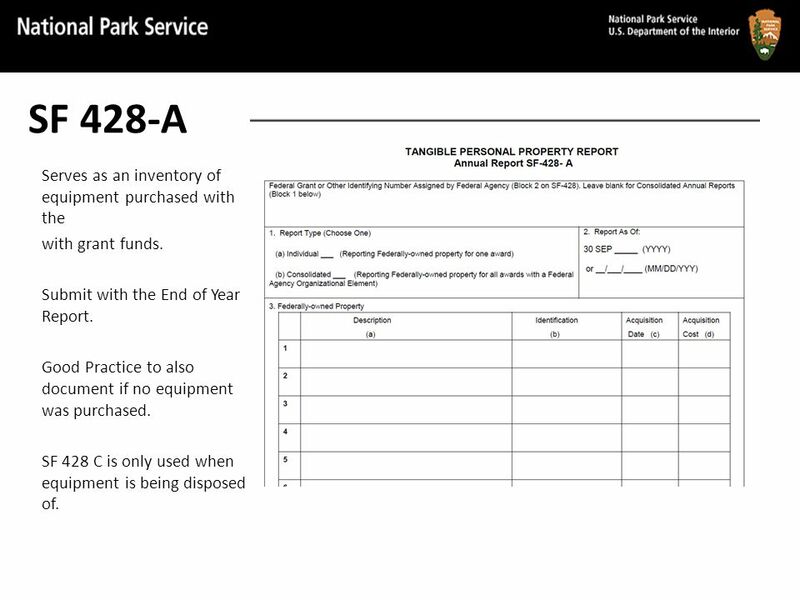 20 SF 428-A Serves as an inventory of equipment purchased with the with grant funds. Submit with the End of Year Report. Good Practice to also document if no equipment was purchased. SF 428 C is only used when equipment is being disposed of. 21 Cumulative Products Tables Compare the estimates and actuals. If there is a great difference an explanation should be provided. This includes all SHPO activity regardless of funding source. 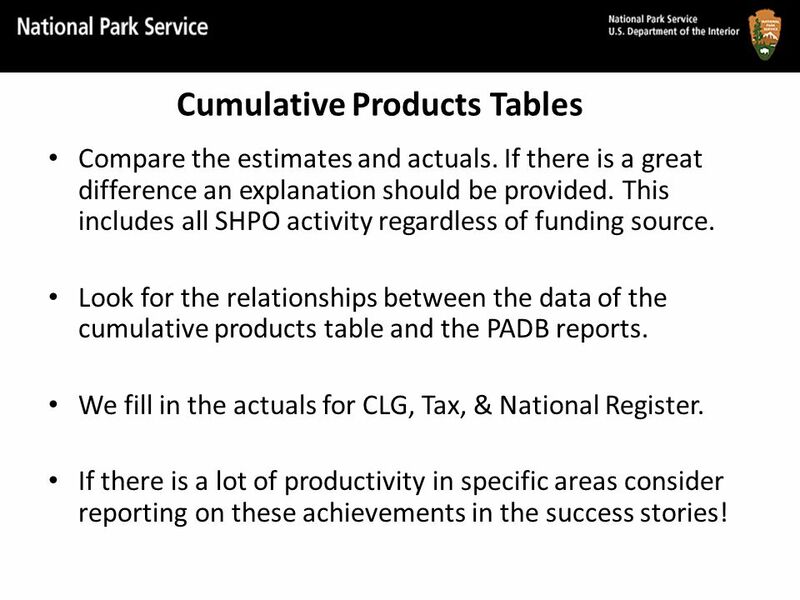 Look for the relationships between the data of the cumulative products table and the PADB reports. We fill in the actuals for CLG, Tax, & National Register. If there is a lot of productivity in specific areas consider reporting on these achievements in the success stories! 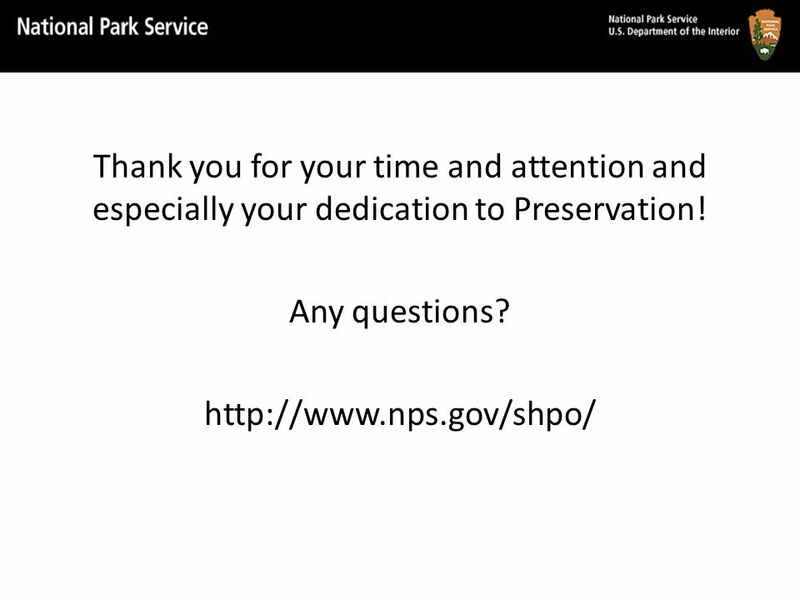 Download ppt "Historic Preservation Fund End of Year Report Review December 2014." 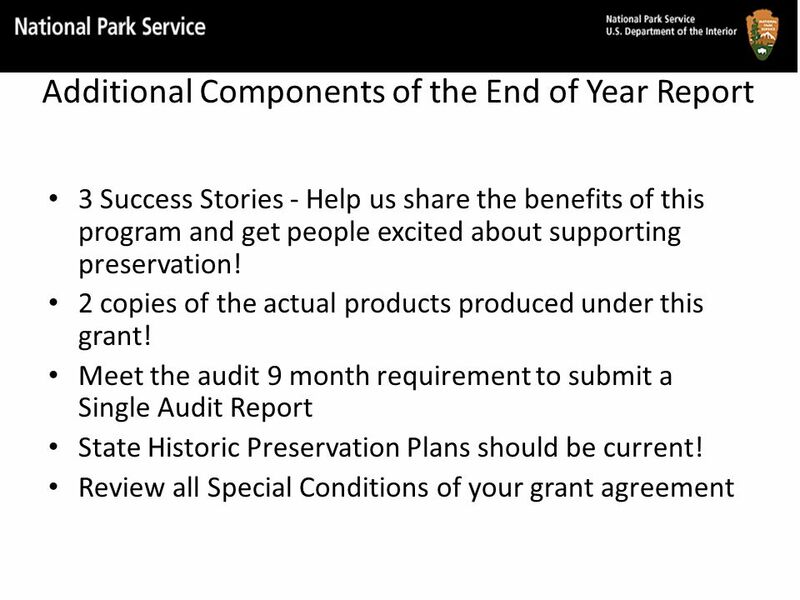 State Historic Preservation Office Program Historic Preservation Fund FY2012 Close Out and FY2013 End of Year Report Review December 2013. U.S. Jurisdiction Summary Chart Legal Requirement re: Duties of Child Representative Child’s AttyBest Interests Representative Categorization Required. 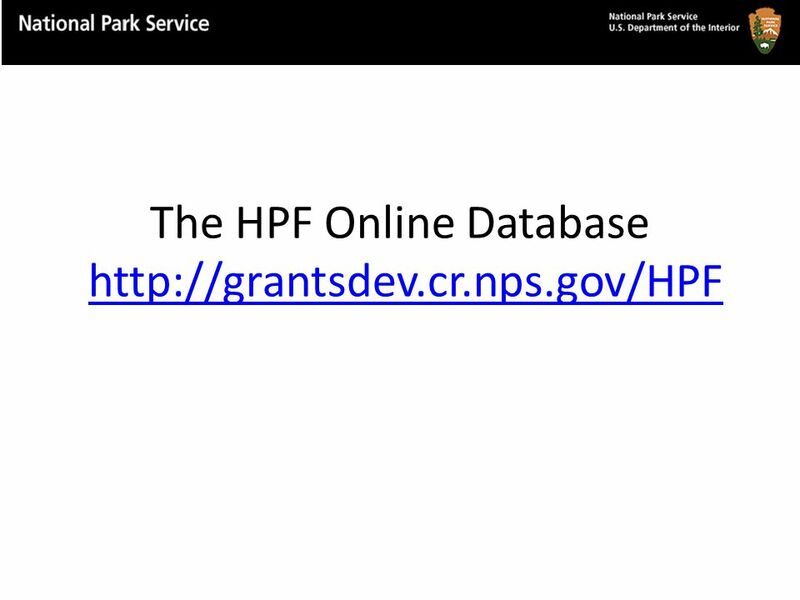 State Historic Preservation Office Program Historic Preservation Fund FY 2014 Application Review January 2014. Preparation for the RPSGT Board Certification Exam Overview of Features. AASHTOWare Program Benefits Standing Committee on Highways October 18, 2013 Tom Cole, Idaho DOT AASHTO Special Committee on Joint Development. Presidential Nominations. Who selects the nominee? Historically… Members of Congress State party leaders Primary voters –(Or just those in Iowa and New. Understanding the Electoral College 4 elections won without Popular Majorities Understanding the Electoral College the popular vote has meshed. SSSS John Lindback Executive Director. Today’s Agenda 1.What we do 2.Who we are 3.How we do it. Admissions Process Step 1: Undergraduate Application Step 2: Christian Character Reference Step 3: Academic Information (High School transcript, ACT or.